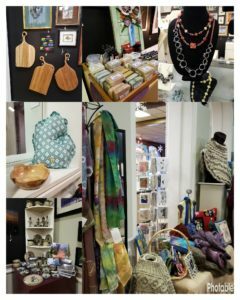 Located at the Art Center of Battle Creek, the gift shop specializes in works by Michigan artists as well as nationally known artists. Included in the shop are unique gifts, paintings, ceramics, jewelry, books and much more! The Art Center is always looking for new and unique art work for its gift shop. Online gift shop coming soon! Many new artists and all of our favorites are featured this year in our expanded Gift Gallery season we call Holly Mart. Here are just a few items that can be found for sale.